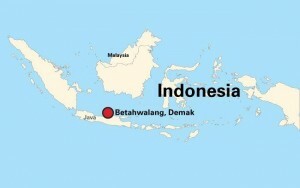 Indonesia is the second largest producer of wild capture seafood in the world, feeding Indonesians, but also exporting much to other countries. During a recent site visit to Indonesia, I was excited to learn about a local, small-scale fishery that plays a part in a big international seafood market: blue swimming crab. Because of the importance of blue swimming crab , the Blue Swimming Crab Processing Association (APRI; a group of Indonesian crab processors), has partnered with the Sustainable Fisheries Partnership (SFP) to develop a “Fishery Improvement Project.” The purpose of the plan is to ensure the long term sustainability of this fishery: fishers and processors will use more sustainable fishing and processing methods in exchange for improved access to the U.S. market. 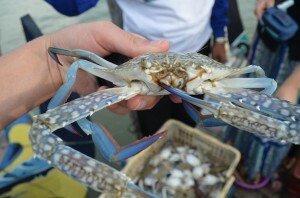 The high international demand for blue swimming crab contributes to the economic and social wellbeing of Betahwalang. 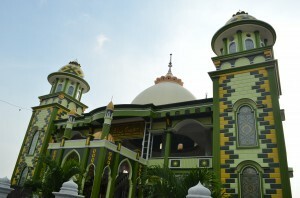 Located in the Demak District, Betahwalang is a small community, nested among mangroves and in the shadow of a beautiful mosque. Fishers contributed a portion of their profits to build the mosque, which is the pride of the community. Crabs are valuable and local fishers can earn $5 or more per kg of crab they catch. District government, industry, and religious and village leaders on a plan to better manage blue swimming crabs. They are making efforts to implement and enforce a variety of regulations to help protect crab stocks. The partners hope to focus fishing on crabs 10 cm and larger, and to avoid catching crabs with eggs so they have time to mature and reproduce. They encourage the use of traps instead of more indiscriminate trawl nets to reduce catching unwanted species, and have established a no-take zone to help protect spawning areas. Village level action and implementation of a Fishing Improvement Project are innovative steps in Indonesia, with the fishing sector helping lead work to improve the fishery with university and government support. Fish Forever is a recently launched initiative with our partners Rare and University of California at Santa Barbara (UCSB). Its goals are to end overfishing in near-shore fisheries, protect biodiversity, and secure local livelihoods in Indonesia and other tropical countries. 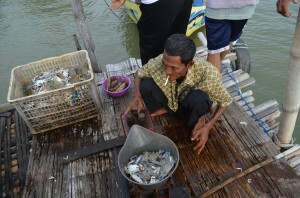 Fish Forever aims to build on the efforts of the local community, such as those in Betahwalang, by developing Territorial Use Rights for Fishing (TURFs) and no-take marine reserves that allocate secure privileges to fishers to their fishing grounds, ensuring both the sustainability of the resource and the fishers’ livelihoods. By testing a TURF and reserve in Betahwalang, we hope to garner interest in neighboring communities to establish similar systems tailored to local needs. A regional system of TURF-reserves could help sustain this important fishery, and benefit fishing communities. By giving fishers secure access to their fishing grounds, they will have a vested interest in fishing sustainably, thus allowing their important fisheries to recover (crabs or otherwise) and ensuring plentiful fish stocks for future generations. What is needed to sustain healthy ocean ecosystems and local livelihoods in Myanmar? 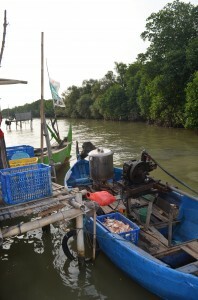 This entry was posted in Fish Forever project, International and tagged blue crab, blue swimming crab, fishery improvement plan, Indonesia, small-scale fisheries. Bookmark the permalink. Both comments and trackbacks are currently closed.